In Voices , Ursula Le Guin does something I wouldn't have thought possible: she takes nearly every trope of the fantasy genre and deliberately sets them aside. Vows are broken, what seems magic becomes mundane, the mundane reveals itself as magical. There are no simplistic battles between good and evil here, no magic spells generating greater and greater explosions until the author gets tired or runs out of imagination; the resolution is more subtle than that, and more complex. This might sound dull—magical battles are flashy, and can be fun, at least for a while—but it all works, much more so than the average clichéd fantasy. And the vow, in a sense, turns out not to be broken after all. Seventeen years ago the city of Ansul was conquered by the war-loving Alds. Ansul was known for its learning, and especially for its library, but the Alds believe that writing is evil and have ordered all books destroyed. They also believe that women should not be seen outside without a man, and so Memer, a seventeen-year-old girl, goes out to do the shopping disguised as a boy. Memer lives in a great house called Galvamand, a place that once also held the university and library. The Alds think they have destroyed the library, but when Memer is very young she finds a secret room filled with forbidden books. Fittingly, she gains access to this room through writing; she somehow knows how to create the letters that open the door. When the Waylord, the head of the household, discovers her in the library, he begins to teach her how to read. Then one day, while Memer is out shopping, she meets two very charismatic people. Orrec is a storyteller who has been called to Ansul to recite for Ioratth, the Ald in charge of the city; he is there with his wife Gry. And if that isn't seductive enough for a girl who grew up on stories of heroes, Gry also has a lion. Gifts (2004). That book also begins with the arrival of a stranger, and I wonder if the later books will do the same thing. I hope so, and I hope Memer will be that stranger, as Gry and Orrec are here—I'd like to know what happens to these people. Because these are, in fact, the kind of characters that stay in the mind after the book is closed. Memer is a siege-brat—her mother was raped by an Ald and died soon after—so she comes by her hatred of the Alds honestly. Her voice is quiet and compelling, one of the reasons the book works so well; you see the choices the citizens make through her eyes, and come to understand them. The Waylord was tortured by the Alds for the location of the library and his house was left in ruins, and yet he retains his dignity despite his broken body. He can read books, and read oracles—in Ansul these seem to be the same thing—but for the most part he keeps that knowledge to himself. Orrec the storyteller wants desperately to read the lost books of Ansul, but at the same time he understands the fear the citizens have lived with for seventeen years and he doesn't press them. And Gry is just very cool, a wise and competent woman who can call lions. Even the Alds are more than two-dimensional villains; this is part of the subversion of fantasy tropes I mentioned earlier. As with all of Le Guin's worlds, the city of Ansul is a real, living place. The people of Ansul and Ald have their own customs and government and proverbs, and religion is especially important to both of them. Ansul has, as Memer says, "more gods than anybody else has anywhere" (p. 24). Elsewhere she attempts to list them: gods of the forest and the hills, gods of the household and of ancestors, "Ennu who makes the way easy, Deori who dreams the world ..." (p. 172). The Alds have only one, Atth, the Burning God, to whom all light and righteousness belong. And so the struggle between the two is not just over the city but over beliefs: the Alds are certain that the people they have conquered are heathens, worshippers of Obatth, Atth's enemy on earth. But as the Waylord says, "Having one king, one god, one belief, they can act single-mindedly. They're strong. Yet the single can be divided. Our strength embraces multitudes. This is our sacred earth. We live here with its gods and spirits, among them, they live among us." (p. 143) You can certainly read a topical message into this, but there's also a truth there that goes beyond a single time and place. The citizens of Ansul want to rise up against their rulers, of course, and some of them gravitate to Orrec, hoping he will be a catalyst. And so the stage is set for an epic battle, the good people of Ansul against the evil Alds. Except it doesn't quite happen that way. I wish I could tell you what does happen, but to say more would violate the Reviewer's Oath: First, give no spoilers. 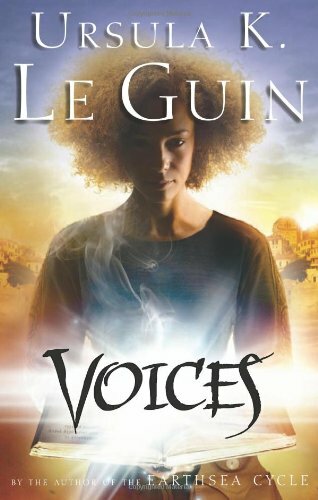 Voices is wonderfully told, with surprises and revelations at every turn, and you really have to discover it for yourself. But it turns out that old Anton Chekhov was wrong: you don't have to fire that gun after all. Lisa Goldstein's latest novel is The Divided Crown , written under the name Isabel Glass. Her novel The Red Magician won the American Book Award for Best Paperback. She has worked as a proofreader, library aide, bookseller, and reviewer, and she lives in Oakland, California, with her husband and their cute dog Spark. No, I saw Osama, and read this book, and practically the only similarity is the cross dressing. Reading the book did not bring the movie to mind for me. The cross dressing in the book is one of the fantasy tropes Le Guin is playing with. Watching the movie I was very aware of how it didn't fit those tropes, as they appear in both fantasy and historical fiction - Osama is a very reluctant boy.